Someone was thinking when they came up with this device. If you’re like me, there is limited space in the shop for a lot of extra items, but when doing mechanical work, having the right tools can make the job a lot easier. Tractor maintenance may require being underneath the oil pan on your back, on the side of the engine, or just sitting reading the service manual; for extended periods of time. You need a good creeper, a low stool, and a chair, and you get all three with this innovative 40 inch 3-in-1 floor creeper. The patented floor creeper easily converts from the traditional lay down position, to a stool, to a rolling seat with full back support. It’s great for tractor maintenance, but also for working on cars, ATV’s, or any other piece of equipment you might drag into your shop. Best of all, you can lean it up against your toolbox for storage in the creeper position and it takes up very little space. 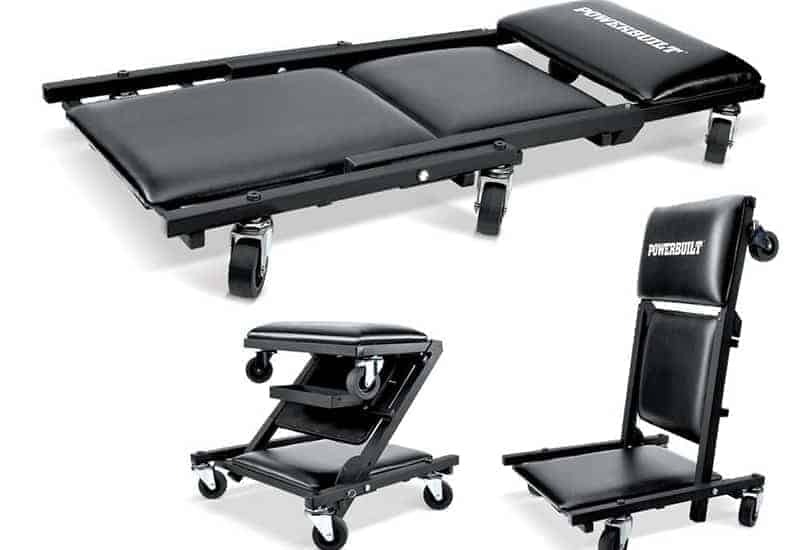 The premium 3-in-1 creeper boasts a tubular steel frame with a padded headrest and deck and a durable black vinyl cover for comfort and quick cleaning. Many cheap creepers have four wheels, this premium model features six precision 2-1/2 inch swivel casters allowing you to maneuver with ease. This Powerbuilt creeper is dependable, affordable and built to last.